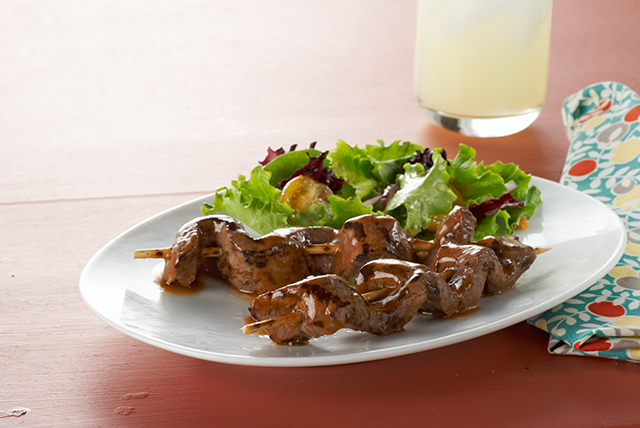 Turn a sirloin steak into an entrée for four with our Caramelized-Beef Skewers recipe. Glazed with a balsamic-Dijon barbecue sauce, these grilled sirloin steak skewers are perfect for summer entertaining or a weeknight barbecue. Toss meat with 2 Tbsp. dressing; let stand 10 min. Meanwhile, mix remaining dressing, barbecue sauce and mustard until blended. Thread meat onto 8 skewers. Grill 6 min. or until meat is done, turning after 3 min. and brushing generously with barbecue sauce mixture. Serve with hot cooked rice and a mixed green salad tossed with your favourite Kraft Dressing. Toss steak with dressing as directed; refrigerate up to 24 hours before grilling as directed. If using wooden skewers, soak them in water 30 min. before using as directed to help prevent them from burning on the barbecue.